Do you want to be the most popular person at the picnic? 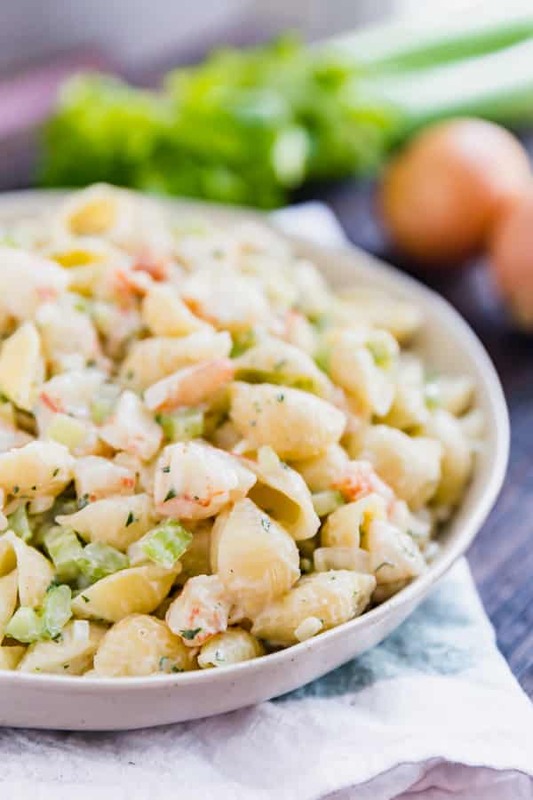 Then make my Grandma’s Very Best Shrimp Macaroni Salad! 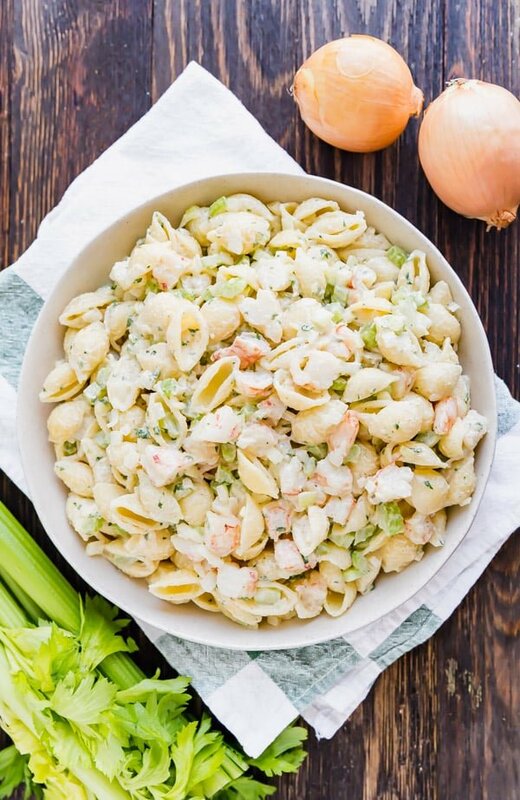 Meaty chunks of shrimp, crispy celery and onions and tender pasta covered in a creamy and super flavorful dressing. Everyone will be back for seconds! 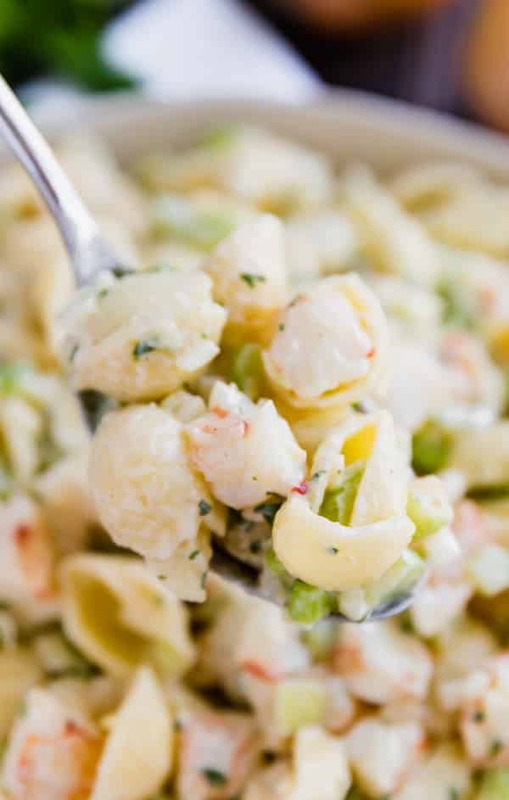 Macaroni salad is the quintessential summer side dish. It’s one of those things I will make and then go back to all day, every day to nibble on. I don’t know what it is, but it just keeps calling me back to the fridge for one more bite! And this macaroni salad recipe is a sure winner! It’s my Grandma Eve’s recipe, so you know it’s going to be awesome (aren’t Grandma recipes always awesome?). 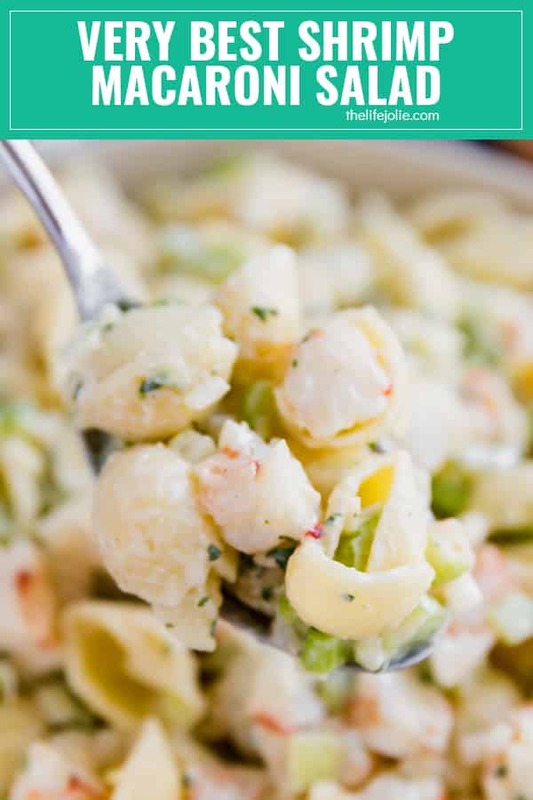 I can remember so many meals that include this shrimp pasta salad and everyone raving over it. Up until now I’m sad to say I had never made it. So when I finally got the recipe, I was a bit surprised by some of the ingredients. They just weren’t what I expected to see in a macaroni salad recipe, at least not this one. But they actually add some really awesome levels to the overall flavor and are probably what gives this salad it’s addictive quality. If you can, buy shrimp that’s already cooked, it’s one less step for you. Make it ahead. Letting it sit in the dressing a little bit helps it all meld together and deepens the flavor. Taste the dressing as you go. This is pretty much the case for any cooking recipe (not so much baking) but take the measurements as a starting point and make this to your taste. This recipe makes a pretty large amount. If you’re not serving a crowd, or you don’t want as many left overs, half it. Do you want to be the most popular person at the picnic? 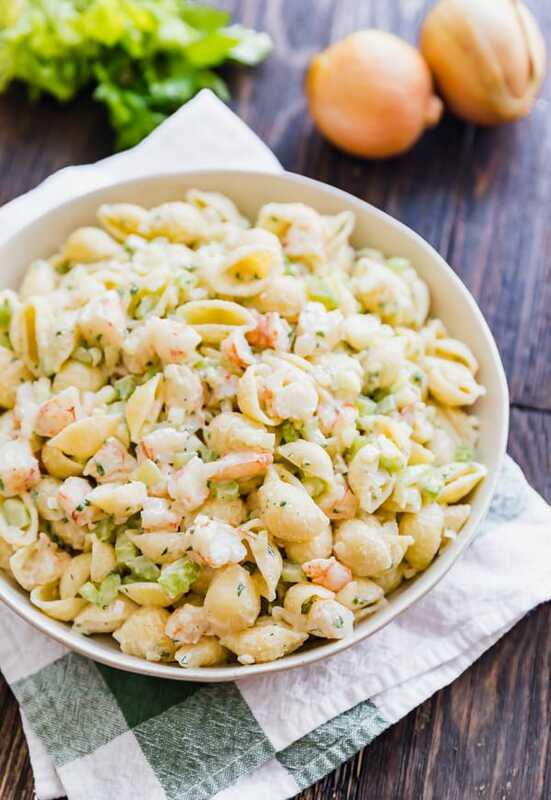 Then make my Grandma's Very Best Shrimp Macaroni Salad! Meaty chunks of shrimp, crispy celery and onions and tender pasta covered in a creamy and super flavorful dressing. Everyone will be back for seconds! Add dressing and mix well to combine. Refrigerate for at least 1 hour or until you're ready to serve. Taste and adjust seasonings to your taste. April 2, 2018 at 9:12 am This is great timing! I just bought some of the tiny shrimp on sale at the grocery store. This will make a great side dish this week! April 2, 2018 at 11:51 am I understand the "going back to the fridge for tastes!" thing. I'm sure I'll be doing that on this salad! Thank you! April 3, 2018 at 4:24 pm I can see why this makes you so popular! What an amazing pasta salad. 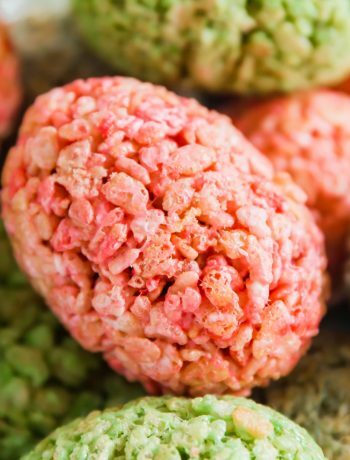 Looking forward to making it for my summer potlucks! April 4, 2018 at 3:22 pm Thanks Kat- I hope you enjoy it! 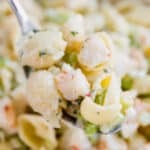 April 6, 2018 at 1:56 pm Celery and onion just make a pasta salad pop! Love those flavors together! April 6, 2018 at 4:04 pm I totally agree- the flavors and especially the crunch!! April 6, 2018 at 9:29 pm This sounds incredible! I can't wait to try making this! April 7, 2018 at 2:50 pm Thanks Carolyn! June 29, 2018 at 4:03 pm I made this salad a couple of days ago and everyone enjoyed it! What a delicious sauce....! A keeper for me. Thanks! June 30, 2018 at 4:40 pm Thanks Denise- I'm so glad you loved it as much as we do! July 17, 2018 at 8:19 pm Thank you for the recipe my family loved it just made it today as a side for fried catfish nuggets. I made an extra batch of the dressing and we dipped the nuggets in it mmmmgood! July 17, 2018 at 8:25 pm Awwww thank you Kelly- I'm so glad you loved it and BRILLIANT idea with the dressing! On a side note, catfish nuggets sound delicious- where can I find that recipe? Yum! July 18, 2018 at 10:14 pm I love it - work smarter, not harder! 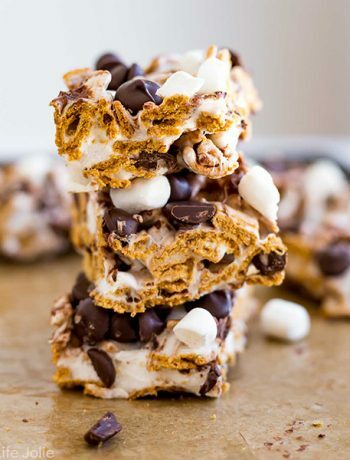 I am definitely going to have to make some. I haven't had catfish in ages and I miss it! Thank you for sharing! October 7, 2018 at 2:53 pm I made this today and it is delicious. I'm thinkiing next time, I might try it with smoked salmon instead of shrimp. Can't wait to try the dressing as a dip like Kelly Mathieu did! 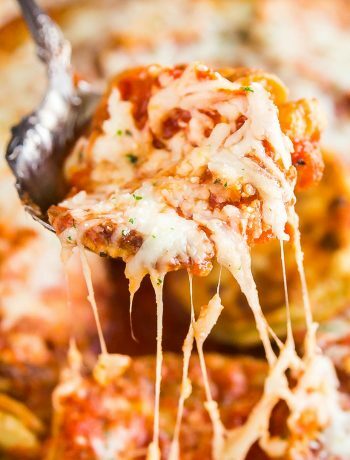 December 12, 2018 at 6:02 pm OMG! This will be my go to from now on till infinity! Did what you instructed and kept tasting, thought it needed a little more zing so added about a quarter cup Miracle Whip. Perfection for my family’s tastes! Thank you so much for sharing. December 12, 2018 at 9:32 pm I'm so glad you love it as much as we doo! It sounds like you made a tasty addition!- thanks for sharing! December 26, 2018 at 12:44 pm You can totally use spring onions. The flavor may be a little stronger, but if you like onions this will be a good swap. Enjoy! December 24, 2018 at 8:29 pm I made this for my family for Nochebuena - absolutely DELICIOUS! I wanted to incorporate seafood somewhere in our dinner, and this is perfect. We haven't even had dinner yet but I had to get a bowl for myself because it was that good. I'm in love with the dressing too! I added some carrots for some more crunch and color. I can tell I'll be making this over and over! Thank you so much! April 14, 2019 at 2:37 pm Hi Verne- you totally can. But maybe add a tiny bit extra of the other ingredients to balance it out (taste it as you go). Enjoy!